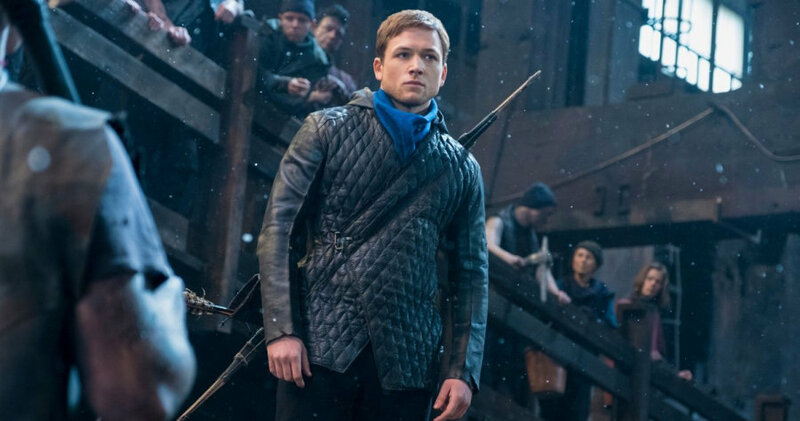 Robin Hood tells a story of Robin of Loxley (Taron Egerton) a war-hardened Crusader and his Moorish commander (Jamie Foxx) as they mount an audacious revolt against the corrupt English crown fronted by the Sherriff of Nottingham (Ben Mendelsohn). The producers of this film thought that the best way to make this film was to reimagine it by putting a modern spin to it. This contemporaneousness reflected in the garb of the cast, their language, the city and even the weaponry. However, this twist is a good idea only on paper because on the big screen it made the film lack soul making the film tacky. The audience is unable to connect the old Robin Hood tale with what is playing out on the screen so it left us feeling lost and confused. Also, in an attempt to create an identity for the film, the producers infused a spin to the character of John (Jaime Foxx) and quite honestly, this didn’t work for us as he seemed out of place. The real disservice to the Robin Hood tale in this film is the plot which was full of holes and very tawdry. The film attempts to relive the essence of the old Robin Hood tale about stealing from the rich and giving to the poor and included Robin challenging the church and monarchy as some sort of vigilante- but sadly, this angle failed due to poor acting. I dont blame the cast for the wretched show as it was caused by a poor script making Robin Hood a chore to watch. The standout character is Ben Mendelsohn as he was really villainous. Another upside to Robin Hood was the CGI and fight sequences which were adrenaline-charged. The producers used a lot of Slow Mo in the action sequences to good effect, making it the best part of the film. Spoiler Alert! Robin Hood will have a sequel…which is an idea they should shelve because this first installment is a bit of a bummer. Anyways, if you think that there should be a sequel, please let me know in the comment section below or on Twitter and Facebook so we can talk about it.